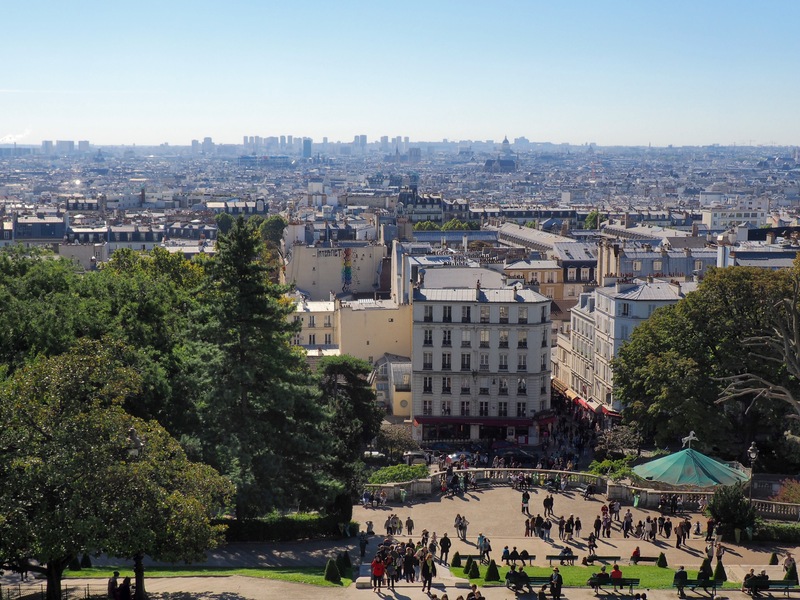 Montmartre feels like what you pictured Paris to be before you got there. With its winding, narrow streets lined with old, pastel colored buildings, you half expect to turn a corner and run into Van Gogh himself. 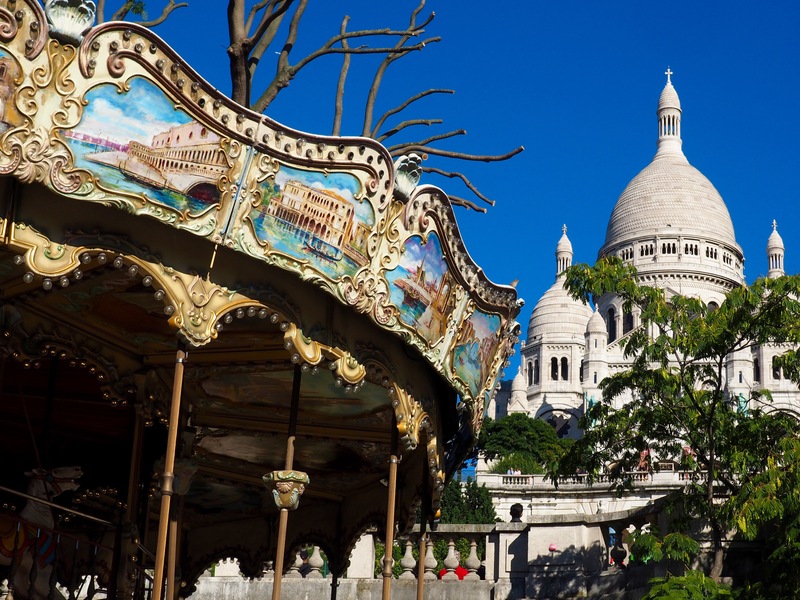 And while this particular part of Paris has certainly not escaped the city’s influx of tourism, it’s still retains an undeniable, old world charm. 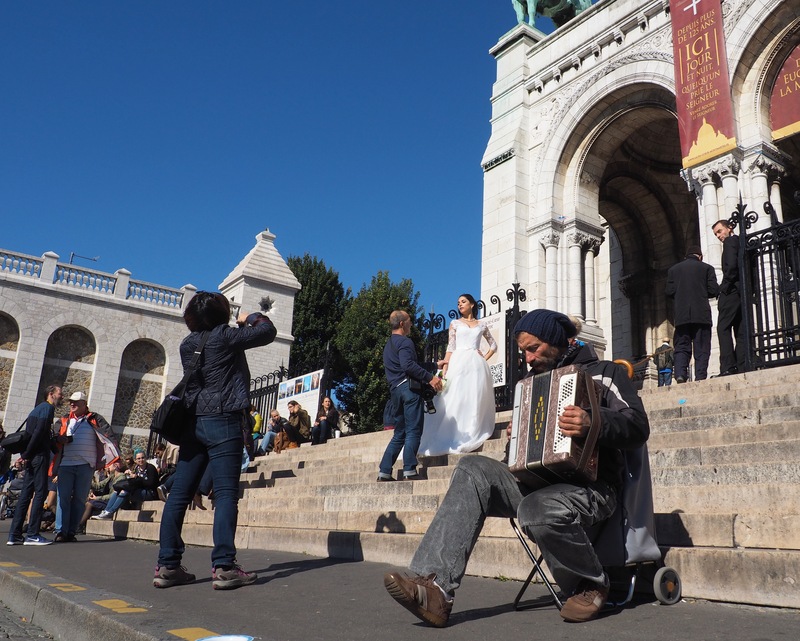 The steps of the Sacre Coeur, a basilica which sits at the highest point of Paris, were swarming with people when we arrived early in the afternoon. There was a harpist playing old folk songs and sitting there, in the company of hundreds of happy strangers, listening to his rendition of El Pasor Conda was maybe one of the most serene moments of our trip. An old world merry-go-round at the foot of the many steps. We tore ourselves away after a few songs to explore inside the basilica. Despite how beautiful it was, I was struck, and somewhat disappointed, by how commercialized it seemed. While a mass went on, tourists were talking loudly and taking photos as they shuffled along the perimeter of the pews. Every few feet there were souvenirs for sale, including several of those machines where you can crank out little imprinted coins. 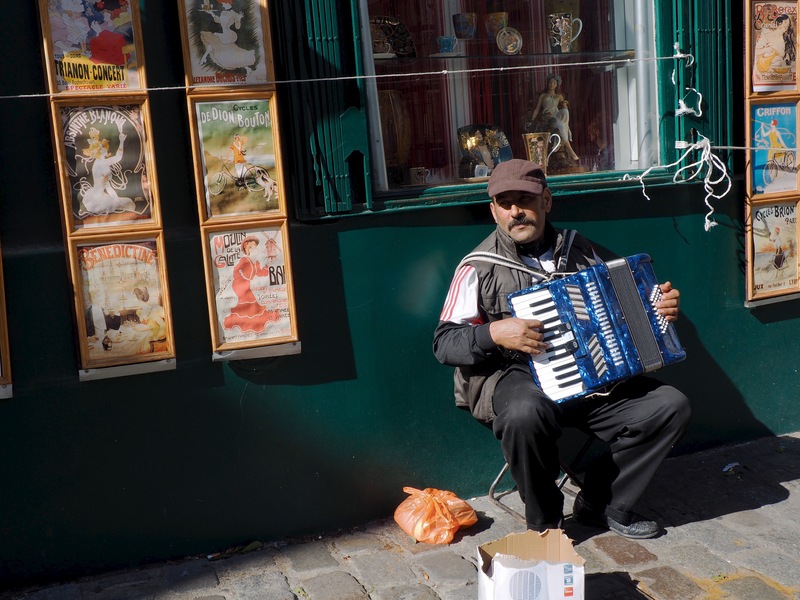 It was a bit baffling, to say the least, but it was something we continued to notice throughout our day in Montmartre. 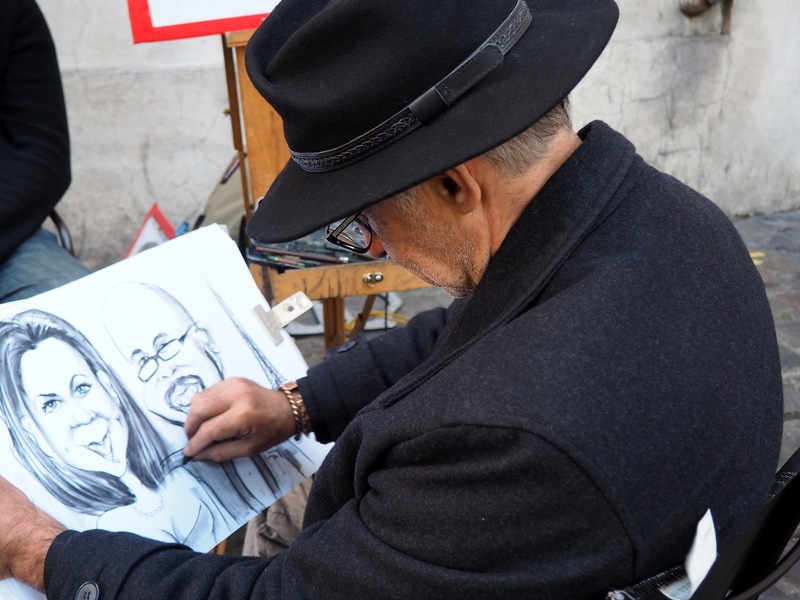 It’s like visiting Little Italy or SoHo in New York – the history is tangible, but even if you’ve never been there somehow you still know it isn’t what it once was. Wedding photos in front of a beautiful backdrop. The main square behind the basilica is full of tourists and restaurant hosts trying to lure you in with specials, and it’s hard to have much confidence in what they are selling. 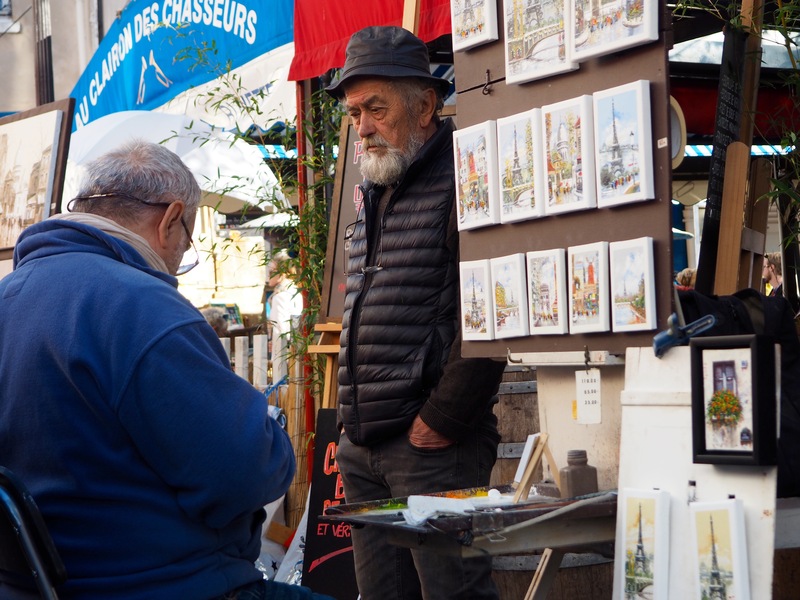 It is fun to see the artists gathered to paint or draw and sell their works, but, upon closer inspection, you start to realize that you have to fish out the genuine talent from the wheelers and dealers. Unfortunately, I doubt the many artist that once called this little enclave home would be able to afford to live here now. 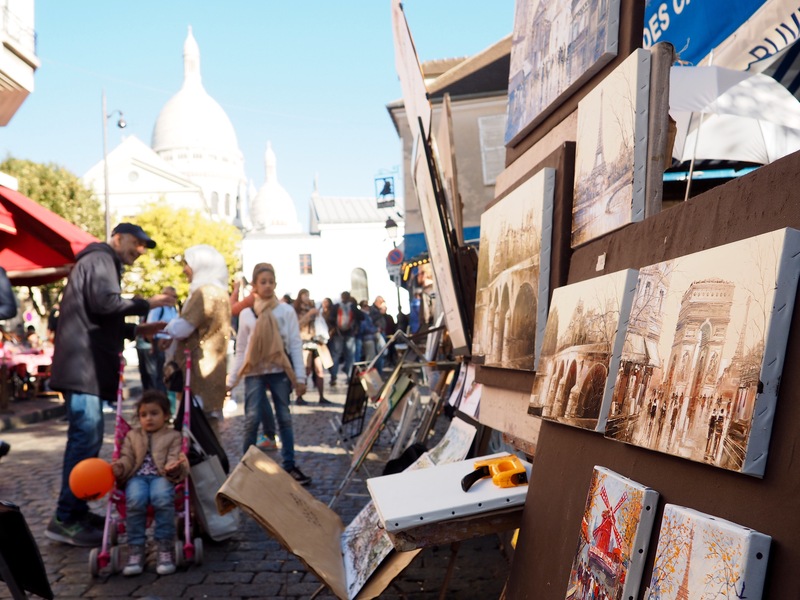 Art for sale behind the Sacre Coeur. I loved the lines of this man’s face; so much character. Eric and I had a caricature drawn to take as a momento of our day. The Moulin Rouge in nearby Pigalle is perhaps the area’s most famous landmark and a huge draw for tourists. 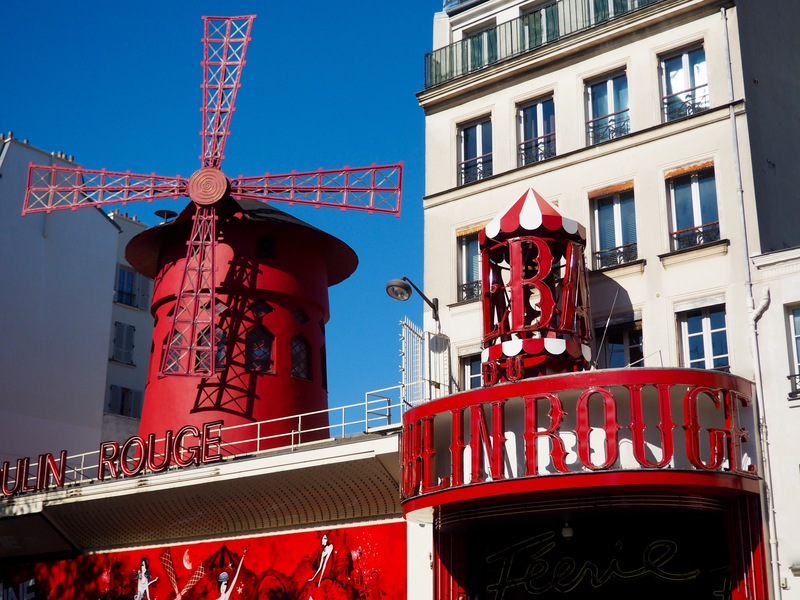 The birthplace of the famous can-can dance, and often immortalize by painter Henri Toulouse-Lautrec, you can still catch a cabaret show at the red windmill, though for far more money than we were willing to pay. 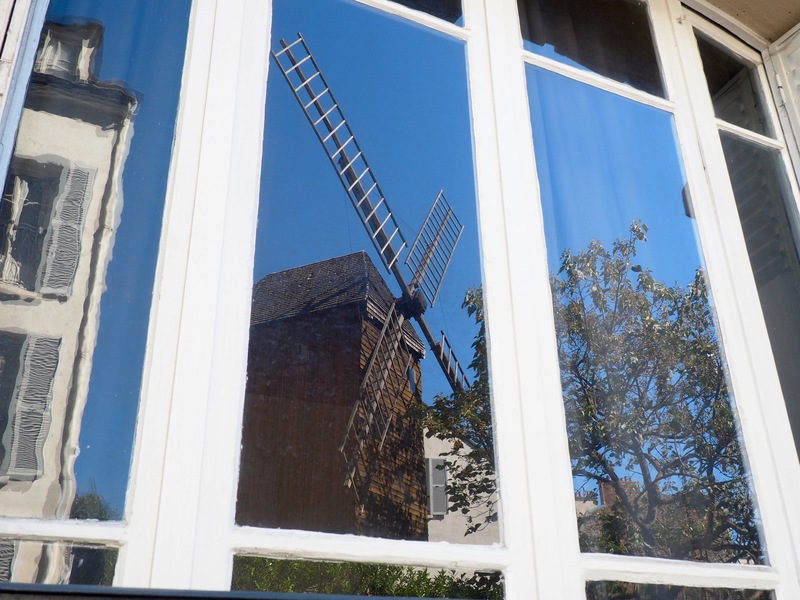 It is certainly worth the stroll to stand outside and snap the obligatory photograph, though I was far more charmed by the area’s lesser known Moulin de la Galette. The lesser known, but perfectly lovely Moulin de la Galette. 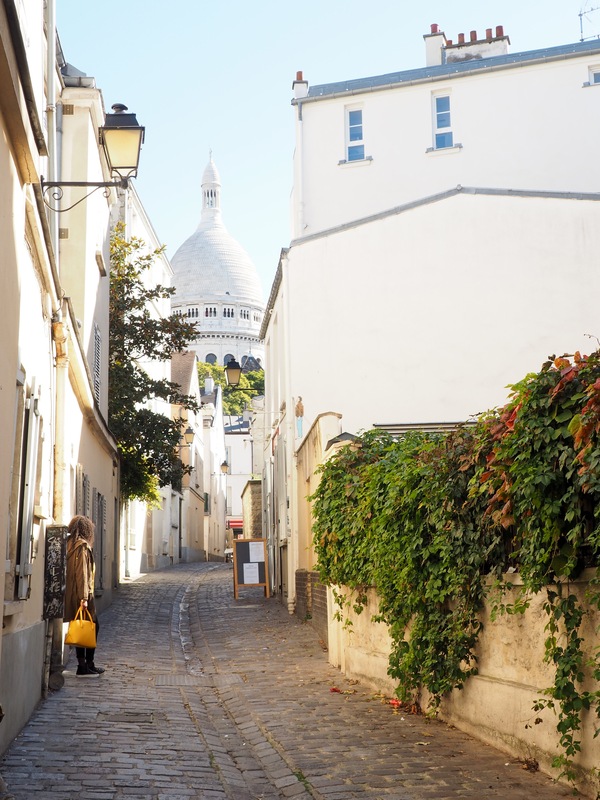 Despite the obvious commercialization that has taken place here, Montmartre still looks very much like you might imagine it to be when Van Gogh and Dali called it home and we had a lovely afternoon seeing the sites and discovering the neighborhood’s many nooks and crannies. 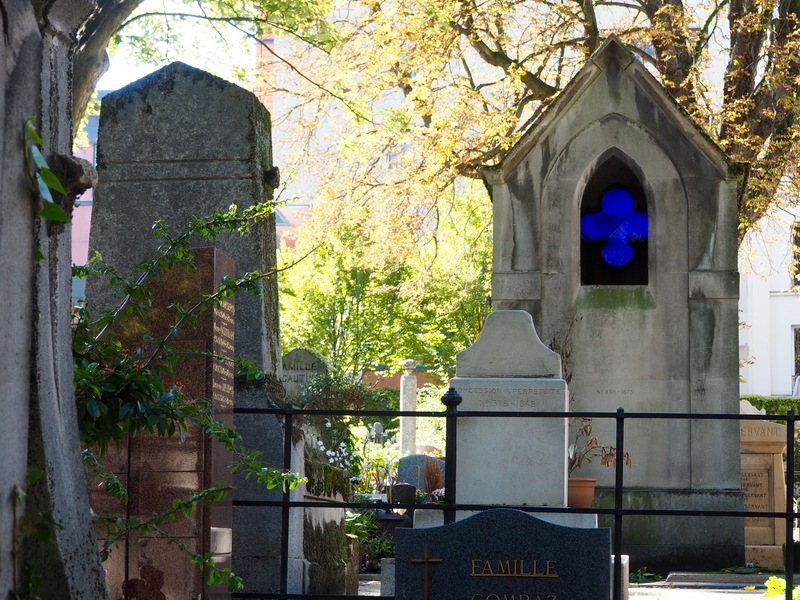 My favorite part of our day was, of course, exploring the Montmartre Cemetery. 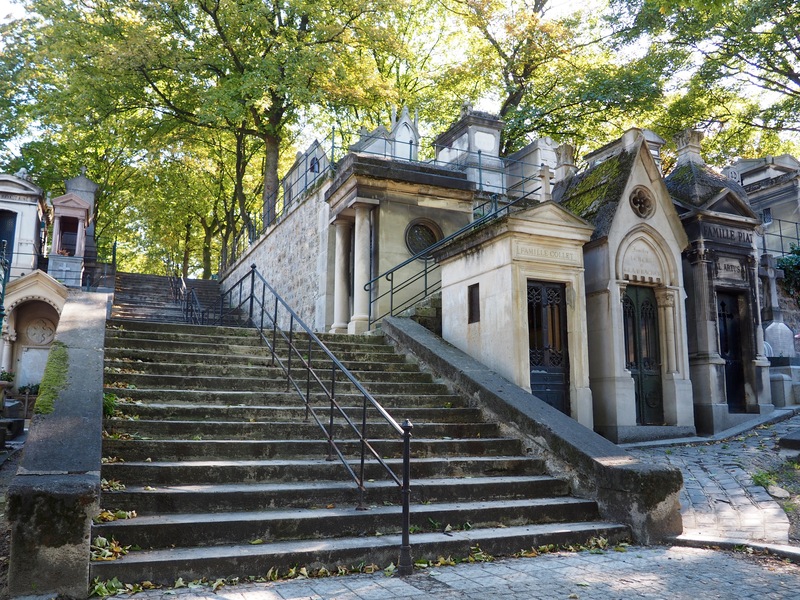 Quite off the well beaten Paris path, it is more peaceful and serene than Pere Lachaise, if not quite as grand. 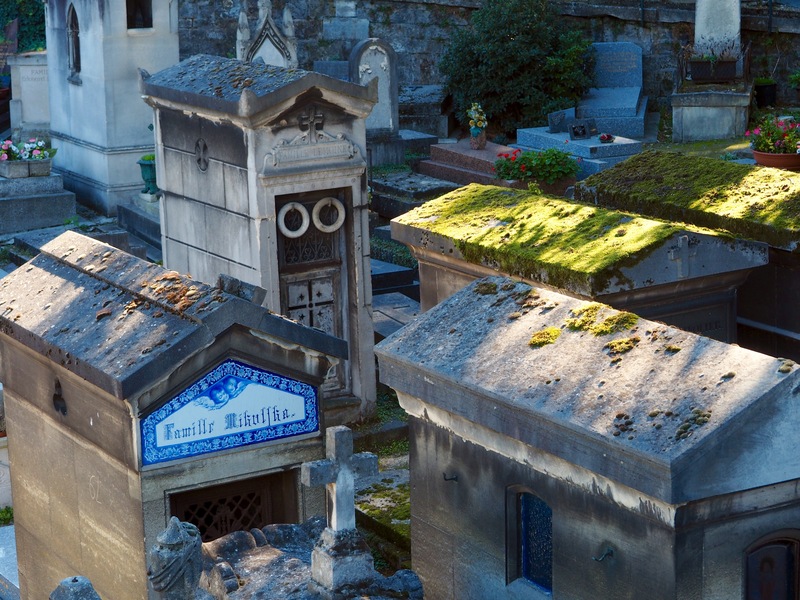 Looking down on Montmartre Cemetery from the intersecting bridge. 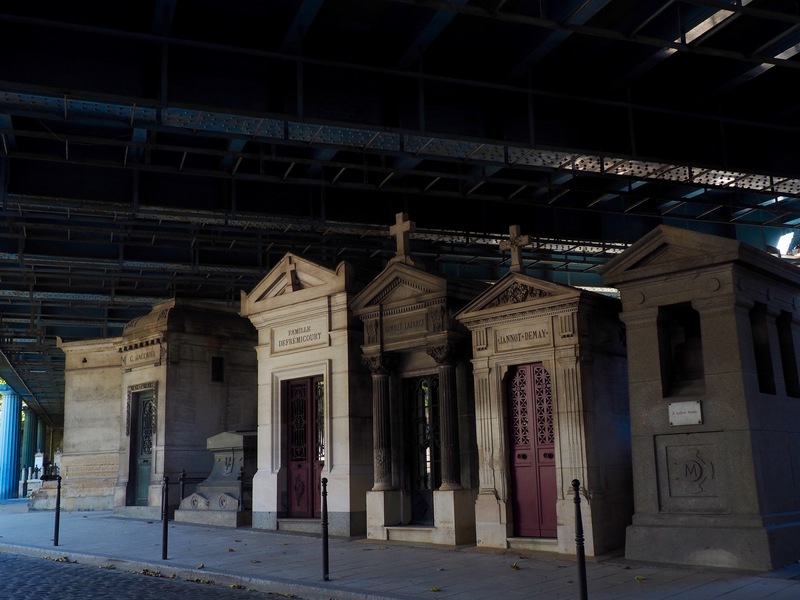 One thing that struck me as particularly strange, however, is the clunky, iron footbridge that cuts the cemetery in two, skimming the tops of the mausoleums and leaving them in perpetual darkness. 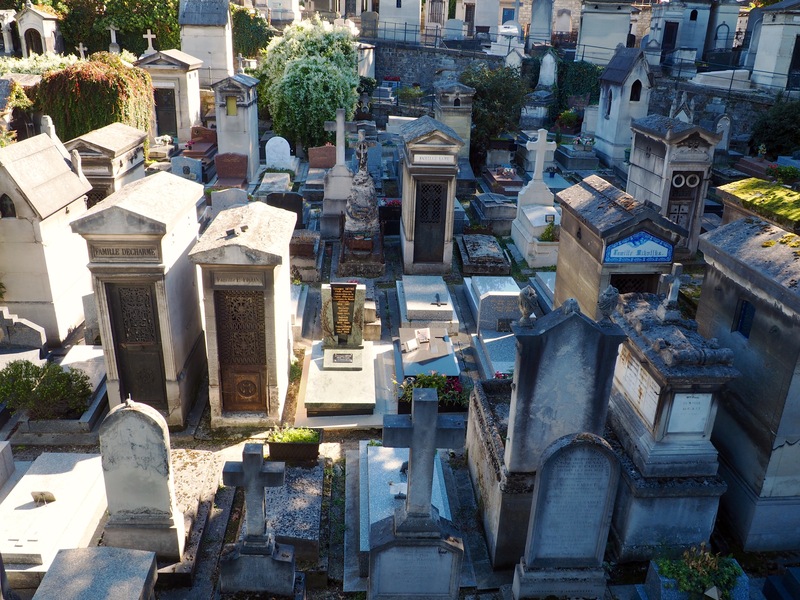 One can only imagine how the families of the cemetery’s residents felt about the massive intrusion to an otherwise peaceful resting place. Mauseleums shaded by the big, iron bridge. 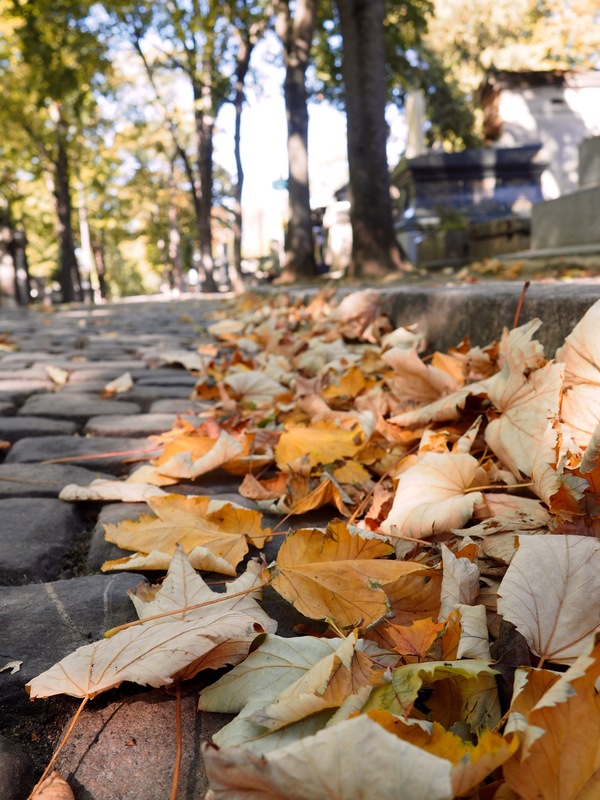 We spent quite a bit of time wandering the many cobblestone pathways, searching in particular for the grave of impressionist painter Edgar Degas and other famed Parisians who are buried here. Unfortunately, we had very little luck in tracking him down, but there was so much to see that it hardly mattered. 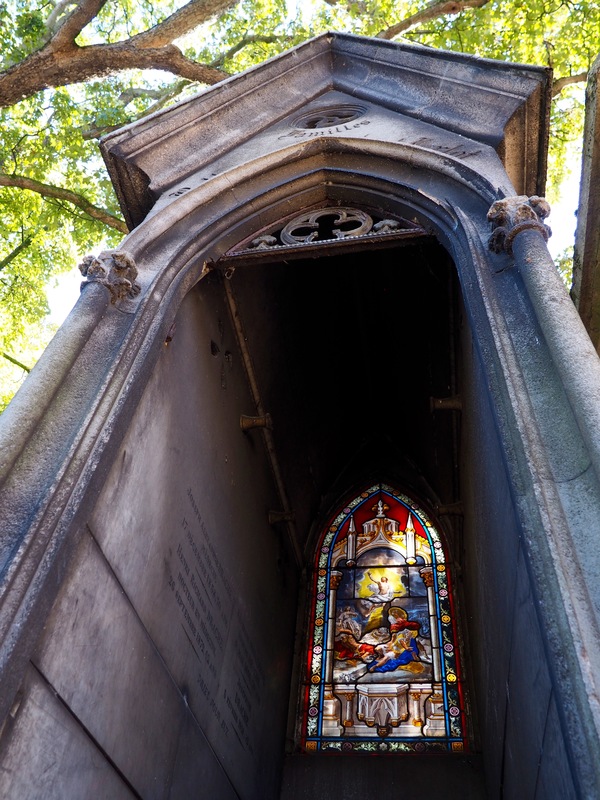 The cobalt blue of the stained glass in this particular grave caught my eye immediately. 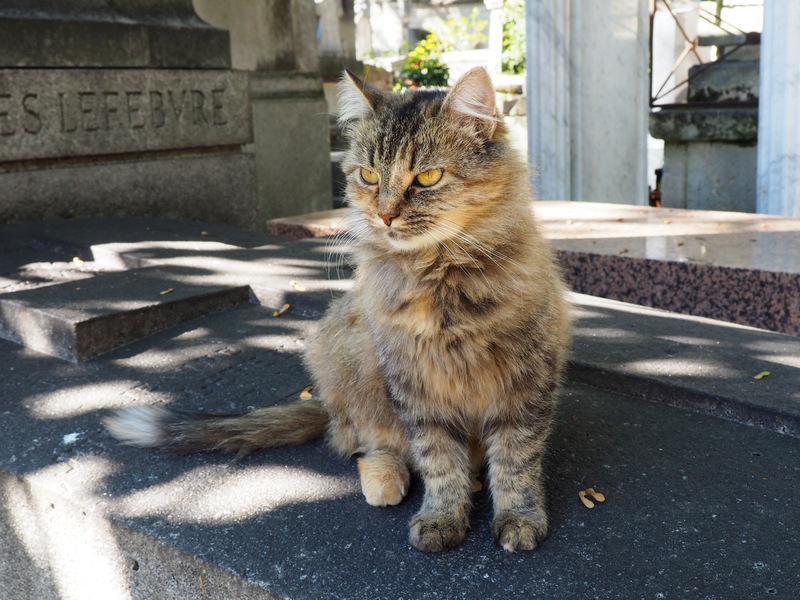 This stray cat wanted some attention and followed us around while we explored. 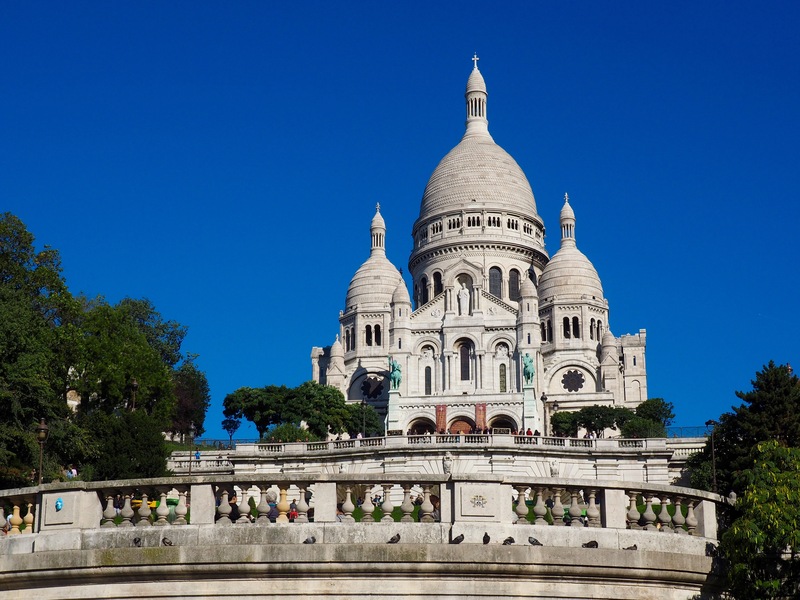 If you are planning a trip to Paris, Montmartre is certainly worth the trek to the outskirts of the city. 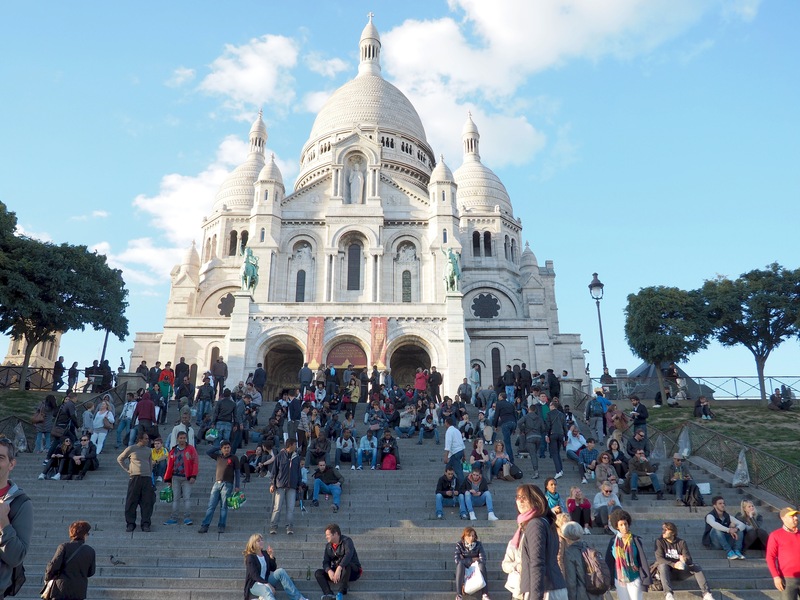 If you are averse to crowds, I would definitely recommend going earlier in the day, though I can only imagine how stunning it would be to sit on the steps of the Sacre Coeur and watch the sunset of Paris. Perhaps on our next trip. Just imagine this view at sunset!